Henri Jayer, who died in 2006, is one of the world's most respected winemakers. He is credited with introducing important innovations in the production of Burgundy wines. He considered that a great wine is made ​​primarily in the vineyard and not in the cellar. He began to make wine in his name in 1950. His Richebourg 1978 is currently one of the world's most expensive wine. Every bottle of this legendary wine is sold several thousand euros. 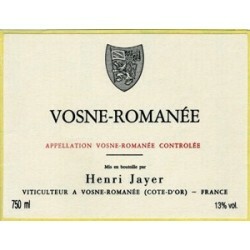 Jayer H. There are 2 products.